My name is Esther, I am a homeschooling, sewing mama of five wonderful children, ranging in age from nearly 20 down to 8 years old. 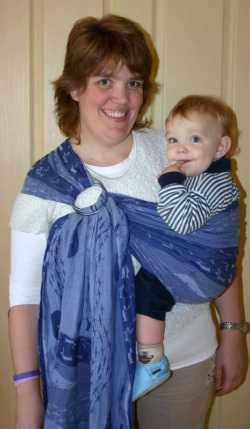 I make ringslings from woven wrap fabric or your own fabric. To contact me, fill in the form on the Contact page or feel free to send me a txt message on 021 156 7732 (within NZ) or 0064211567732 from overseas. Of course you can also email me: keonislings.weebly@gmail.com. All prices in NZ$ for those in NZ and in A$ for those in Australia and include postage within NZ or airmail to Australia. Within NZ, I can receive payments through online banking. Payments from Australia only through Paypal. If you don't have a Paypal account, I can send you an invoice payable with a credit/debit card. Jan from SleepingBaby is fantastic and she graciously allowed me to use the pleated shoulder design for my ringslings!